In this course we consider the individual’s karma and the soul’s movement through many lifetimes in the context of astrological practice. We begin with the Western tradition and its depictions of rebirth and what we call “karma” and dovetail into the planetary daimon to lead you throughout this life. Midpoint in this course is the legacy of ancient India and its depiction of the entire chart as “karmic”. Modern astrology gives us many ways to apply the idea of the soul’s incarnations to astrological delineation and practice. We will take a comparative and critical look from the Theosophical traditions of the nineteenth century through some complexities of Alice Bailey and Dane Rudhyar, to some modern developments ike. Evolutionary Astrology. As a presentation/discussion group, everybody has an important role to play in class discussions and online forums. A basic knowledge of astrology is required, for we’ll look at reinterpretations of astrological symbolism, different modes of delineation, and how to apply them to the charts of ourselves and people in our lives. The Planetary daimones and your soul’s guide. 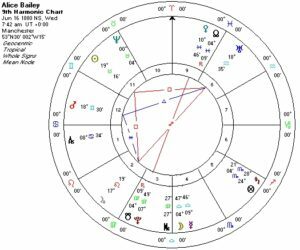 Exploring Alice Bailey’s life and work was one of the happy surprises of the three-part “Character, Calling, Karma: Astrologies of Soul” series. 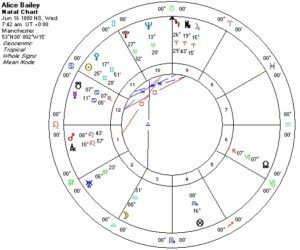 In the context of “New Age” ideas in general, and to the extent that modern astrology is intertwined with these ideas and inclinations, one must acknowledge the influence of Alice Bailey. Her work gives us one of the most original reformulations of astrology in the twentieth century that had many. What do we mean by “New Age”, the words themselves? Alice Bailey and many others were serious about the entire human race currently evolving toward a more spiritualized planetary existence. For those who are attuned to this destiny, their life purpose is to help pave the way for the next steps in planetary evolution, with help from many nonphysical guides. And yes, the New Age was associated with the incoming precessional Age of Aquarius that Bailey felt would begin in the 1990’s. 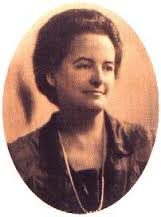 Alice Bailey was a second-generation luminary in the tradition of theosophy that endeavored to blend Eastern and Western spirituality and science as it was then understood – using vibrational synchornization, auras, and energy places on the planet and in the human body (chakras). Although most of her theosophical forerunners inclined toward Indian over Christian teachings, Alice Bailey’s religious leanings were influenced by her Christian childhood and early adulthood. Her general system, including a much reconstituted astrology, is intricate, difficult to master, and insightful. Her writings, and undoubtedly her presence, had a strongly prophetic tone. Alice Bailey was born on June 16 1880 in Manchester, England (7:42 AM) to an upper middle class family and received a good education oriented toward religion and service. 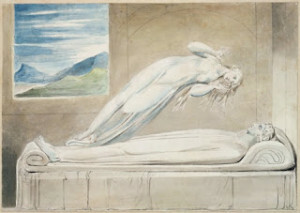 At the age of 15, however, she received the first of many visions of disembodied spiritual adepts, and was then told that she was to do important work in her lifetime. As a young adult she became a missionary, went to India, and met her first husband who was also a missionary. They moved to California and she became a preacher’s wife, mother, and Sunday school teacher. After she and her husband separated, she worked in a factory to support herself and her three children. It was at this time, in 1915, that she began to attend Theosophy Society meetings. 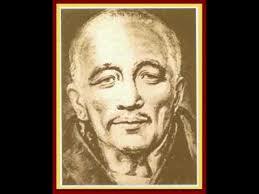 The Tibetan”, Djwhal Khul, who communicated with and gave teachings to Alice Bailey. She took to this material like a fish to water and soon became notable — likely to the irritation of many. She also married Forster Bailey who had a prominent position in the Society. She asserted that, like Helene Blavatsky, she too was visited by spiritual beings who gave teachings to her and who communicated telepathically to her. – most particularly “ This sparked much incredulity among many stalwarts within the theosophical movement. She had gathered with her a strong following, and by 1920 she and the Theosophical Society parted ways She and her husband moved to New York City and established the Arcane School and the Lucis Trust in 1922. . For the rest of her life she would write and teach independently. Most of her writings, however, were telepathically communicated and they do a style that seems strongly inspired. She always was somewhat controversial, because of the radical nature of her visionary writings. Now we look at her natal chart – is this the chart of a prophet? It is certainly the chart of a powerful person. When we look at Bailey’s Ninth Place of Aries we find Jupiter and Saturn and the Midheaven degree, all of course governed by Mars. Saturn is in fall in Aries and this may have made her more vulnerable to being inconsistently overbearing or dictatorial but Jupiter is in far better condition. Both planets of collective consciousness are in sect in her diurnal chart and are also oriental to the Sun. There is a grandeur to this woman, with an Mars-like edge. 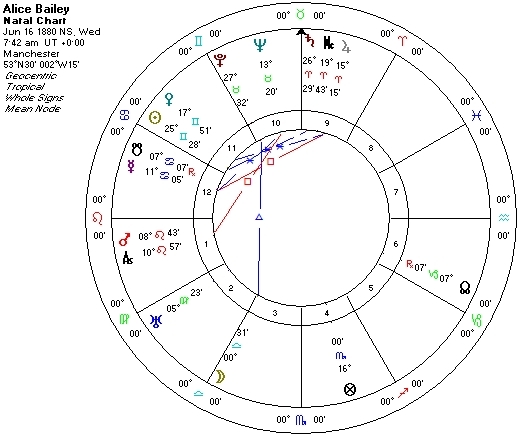 In ancient astrology there were two houses or places about religion, spirituality, and prophecy – the Ninth (of course) but also the Third, the Place of the “Moon Goddess.” Bailey’s Moon is in its “joy” in the Third House in Libra. This is ironic because Bailey’s religious and prophetic leanings had a more patriarchal feel (Ninth House) than is currently in style in the New Age community today. Moon is in Libra applies to – take a guess – Mars in the First, further emphasizing the importance of Mars in her astrological chart. Mercury in the Twelfth Place does not appear to be in good condition, although it is somewhat helped by Jupiter: Mercury’s next aspect to an inner planet is the square to Jupiter in Aries. Mercury in Cancer is also in the exaltation and bounds of Jupiter. This would give Alice Bailey the courage of her convictions, her sense that she had an important message to others. Mercury also has an applying close sextile to Neptune and this correlates to the prophetic and allegedly telepathic source of her work. Neptune is in the Tenth Place of career and this should come as no surprise. At first glance Uranus does not seem to be an important player in her chart, but I was intrigued that the midpoint of Uranus and Jupiter is the Sun. We understand the pair of Jupiter/Uranus to have sudden revelations, quick strokes of good luck, and an enterprising nature unfazed by notions of conventionality. Note the distances from Jupiter and Uranus from the Sun: very close to 70° on each side. This appears insignificant but then we notice that these arcs yield powerful 9th Harmonic Aspects. This harmonic is formed by attuning the chart to the number nine so that the zodiac repeats itself every forty degrees (360 divided by 9). What is the symbolism of the number nine? This number is a trine aspect times three that gives indications of personal fulfillment and carries with it a strong metaphysical or mystical tone. 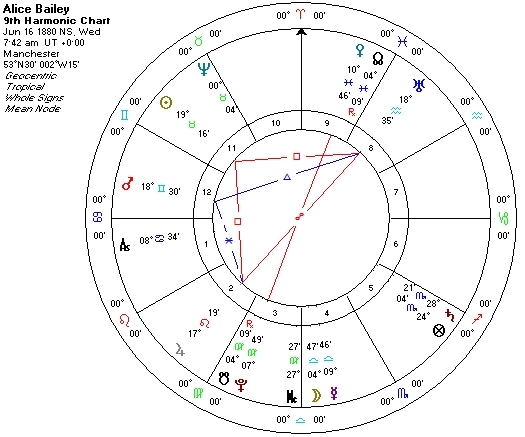 To the right is Alice Bailey’s Ninth Harmonic natal chart. Sign and House placements are not relevant in harmonic charts; we are only concerned with aspects. Here is the Sun with squares to both Uranus and Jupiter that are very close in degree, reflecting the natal situation but easier to see. We also note that Moon and Mercury, 80° separate in her natal chart (that is two times nine), are in a conjunction in her Ninth Harmonic, again pointing to the inspired or perhaps transmitted quality of her writing. Although Alice Bailey had a very conventional religious upbringing, she was going to deviate from expectations. Beginning with her first visitation at the age of 15, her later introduction to the Theosophical Society and her position as an apostate even from that organization, she forged an independent and visionary path that has become very influential in astrology today as well as to the New Age movement in the second part of the twentieth century. Nice information Astrology is the magic which solves every type of problem in your life which is regarding. Astrology is horoscope is the same act which solves the problem but astrology is the more powerful camping to the horoscope.